“You warned her,” said Debbie. “Seeing all we’ve been through up close and personal, you’d think she’d have known better,” said Mom. “This is what she gets for buying an Ercoupe,” said Rio. My family is lacking in, you know, basic human compassion. Sure, I knew that sooner or later—probably sooner—Lisa’s Warbler would suffer his first breakdownon her watch. But still, I felt badly for her. Now, you may recall that the consensus from all the experts we phoned, after pushing Warbler almost a mile across the airport to get him back to his nest, was that he was suffering from a stuck valve; albeit one that was manifesting in a way that no one had really heard of before, what with the prop stuck fast turning one direction, and freely spinning in the other. But they were all wrong. This is the Tale: The very next weekend Lisa’s mechanic drove over from Santa Fe with a trunk load full of tools. He did some tests, poked, prodded, and basically did all the stuff that airplane doctors do to sick airplanes. Rio and I hung out in the back of Lisa’s hangar, rocking back and forth in her rocking camp chairs, staying out of the way, and pretending to surf the internet on our iPads. Really, we were eavesdropping—drinking in every word. After a bit, her wrench-turner decided to fire up the plane. 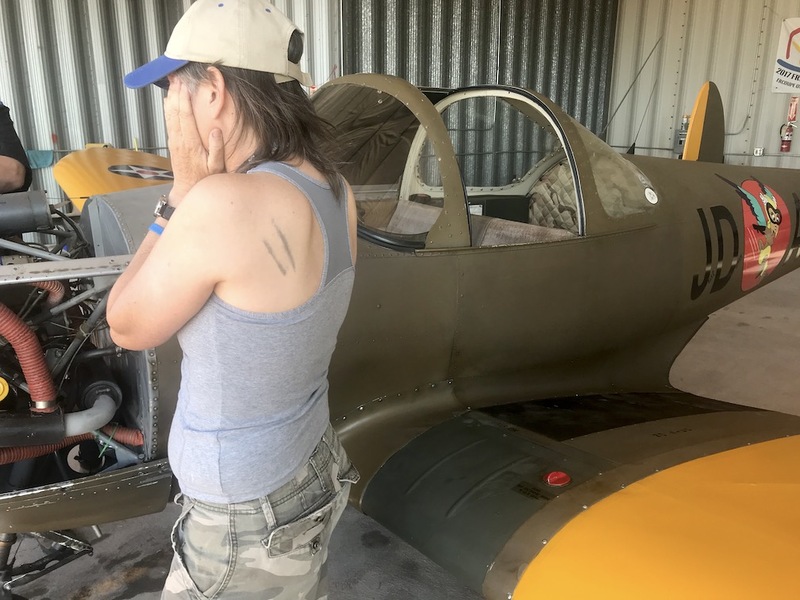 We helped pull Warbler out of his hangar and he fired right up. Lisa was in the cockpit, the mechanic, Rio, and I arranged in a loose ring around the plane, heads cocked, ears aimed at the engine. It sounded, well, not quite right. Or did it? I’d rarely been outside of Warbler listening to his powerplant sing. This was followed by a comic series of hand signs and pantomimes between Lisa and her mechanic. It became pretty clear that they weren’t speaking the same language. The various finger pointing, hand swirling, and gestures mimicked two drunken deaf people leaving a bar and arguing in sign language over whether or not to call a cab. She was saying that in the cockpit, the noise was back. He was saying that outside, it sounded fine. Rio looked at me and shrugged one shoulder. At least he and I were talking the same language. Eventually Lisa throttled up and then we all knew something was amiss. In Warbler’s tongue, he made it clear that something was very wrong with his engine. The mechanic moved his hand quickly back and forth across his throat and suddenly he and Lisa were speaking the same language. She cut the engine. I was secretly relieved. Airplanes sometimes behave themselves for their mechanics, only to act up again as soon as the “parent” is out of the room. I was afraid the man would find nothing, leave, and suddenly Warbler would be back to his antics. 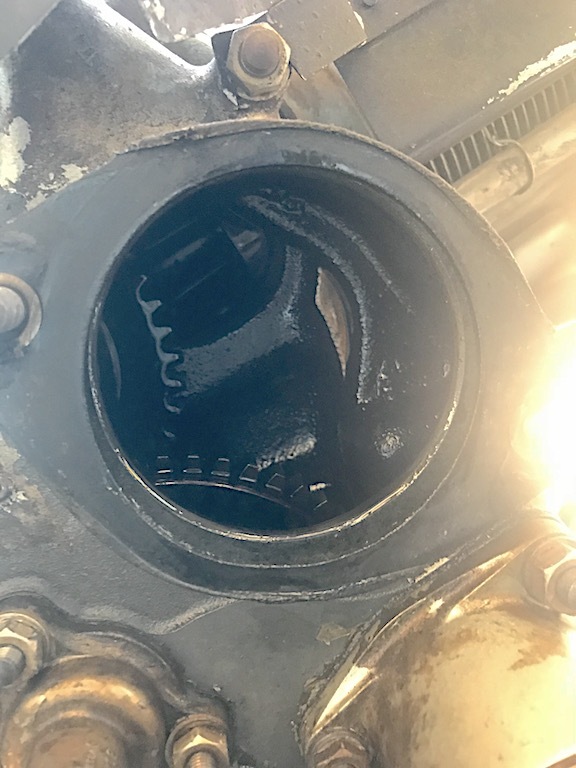 At least—no matter what the problem might be—the mechanic was now witness to it, could hopefully figure it out, and then fix it. The sun beating down, we pushed Warbler back into the shade of his hangar. The mechanic started rocking the prop back and forth when some movement in the engine compartment caught his eye. I missed what he said, but a moment later his head was inside the engine compartment on one side, and Lisa’s head was inside the engine compartment on the other side. Now, if you don’t already know this, the latest and greatest in airplane engines is about as technically evolved as a 1932 gasoline-powered lawn mower. They haven’t changed much in eons. Of course, Warbler’s engine is only one year younger than Warbler himself. He was born in 1946, and his current engine rolled off the Continental assembly line a year later in 1947. I guess engines can’t really roll off of assembly lines, now can they? Well, however it was moved off, it was originally bolted onto the nose of a brand-spanking-new Cessna 140. That airplane later got an upgrade to a more powerful engine, and the cast-off original engine from that plane somehow found its way to Lisa’s plane in the following decades. And you think your family history is complicated. But back to engine tech: An airplane engine generates power from controlled explosions of a gas and air mixture in each cylinder, which drives the piston downwards. The match for these explosions is the spark plug. Airplane spark plugs get their sparks from spinning magnets called magnetos. If the magneto were to stop, the pulses of electricity they make would stop, the spark plugs would stop sparking, and the airplane’s engine would stop. Which would be bad. Accordingly, airplanes have two magnetos. Just for in case. The magnetos are bolted to the back of the engine and are driven by gears inside the crankcase. Once the engine is running, itis spinning the mags that keep it running. It’s really quite clever. At least until one of your two magnetos comes completely apart. And that’s what happened to Warbler. 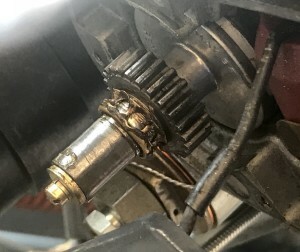 All four screws that held the two clamshell halves of the right magneto together were missing, the case had come apart, and the mechanism was shredded and stripped. Luckily—if these kinds of breakdowns can have any luck about them at all—the damage was to the outside end of the mag, not the part where it attaches to the engine. Those gears were all fine. The solution was ordering a new mag. Well, returning the half-demolished “core” and purchasing a refurib’d replacement. “What’s this going to cost me?” Lisa asked her mechanic. Her mechanic wrapped up the damaged mag in a small blanket, like an orphan baby, and drove away in a cloud of dust. Tess still broken down in another city, there was nothing left to do but break out the bourbon. Now I know what you are thinking: How the heck could all four screws work loose? Did someone forget to replace them after working on the mag? We’ve asked ourselves that; over and over and over again. But like the question about whether or not there was a second shooter on the grassy knoll, this is one of those questions we will never likely learn the answer to. On the surface, it looks like a maintenance failure. Like someone forgot to put the screws back in. But looking though the logs, the mags hadn’t been worked on for a looooongtime. So on the one hand it seems unlikely that all the screws could fall out, but on the other hand, if they were never there, how could the plane have flown so long? Before every takeoff, pilots independently check both mags by using the ignition key to run what is called a mag check. Lisa was religious about doing hers. The right mag always ran rougher, as one or the other of the pair often do in airplanes, but the darn thing was always running. Heck, it was running when she did the engine runup for her mechanic right before the whole mess was discovered. We spent a lot of time talking about the flight hours and the various maintenance log entries from before and after Lisa took over as caretaker of Warbler. In fact, we spent the next two weeks doing nothing but that until her mechanic came back to SXU with a shinny “new” mag. He bolted it on, then fussed around with the prop and a small beeping box, adjusting the timing of the mag so it would spark neither too early nor too late. When he was done, it was out into the sun for Warbler, for an engine test. He sang his throaty song, clear and bright. Even on the right mag alone. Problem solved, right? Not necessarily. The problem with the mag didn’t rule out the possibility that there was alsoa valve problem. One that wouldn’t show up until after the engine had been running at full power for a while. A test flight was needed. Now, Lisa’s mechanic is a pilot, too. Some flying mechanics insist on test flying their work, others don’t. He’s one of those that don’t. As we hadn’t broken out the bourdon yet, I pulled up my big boy pants, pulled on my Chuck Yeager boots, and climbed into Warbler’s cockpit. 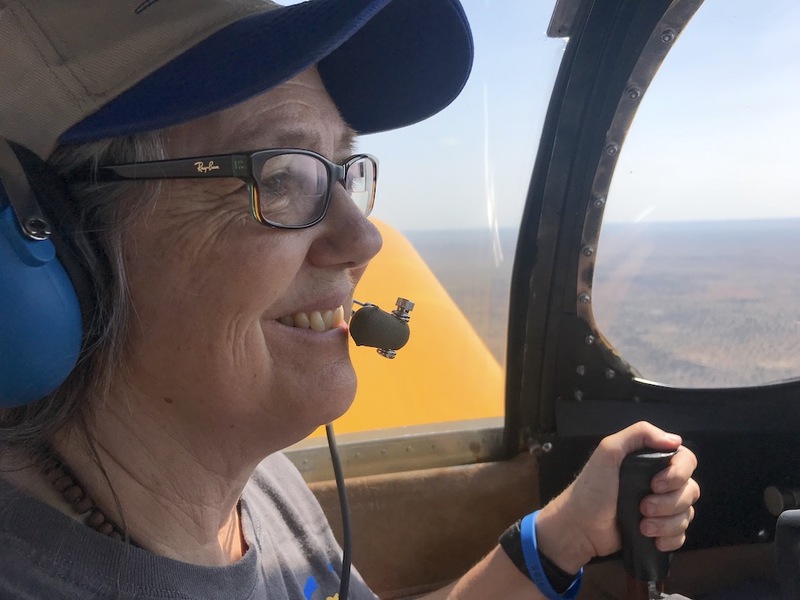 “Stay within gliding distance of the runway,” Lisa’s mechanic told me. I spent the next half hour circling the field by myself, bored to death. It was bumpy as the dickens. Finally, fuel running low, Warbler and I returned to earth. There was no valve problem. I understood. We climbed in, belted in, and headed out. She carefully checked her mags and ran up her engine. The takeoff on Runway One-Ninner was smooth and as she turned and flew down the Pecos River Canyon south of the airport the choppiness I’d experienced in the atmosphere over the airport disappeared. I turned and looked at Lisa at Warbler’s helm, and watched a metamorphosis take place. For the last two weeks, Lisa had been a woman of stone. Her eyes narrow, scowling, dull and flint-like. Her jaw tight, the usual smile absent, replaced by a horizon-straight slit. Her shoulders hunched tight to her neck. Now that all began to melt away. Her shoulders relaxed and dropped, her eyes widened and lit afire anew, and a smile danced at the corners of her mouth, slowly spreading like the growing dawn until her entire face was a picture of pure joy. The magic of flight was erasing the stresses of doubt, fear, and expense that had hung over her like a dark shadow for the last two weeks. Yeah. They have their challenges, but this is why we own airplanes.